The following review is for a product called AZO Urinary Tract Health Support Pack. This product contains both urinary pain relief as well as a cranberry supplement. 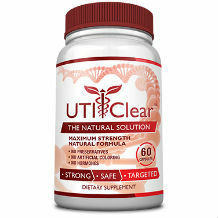 The urinary pain relief side to this product claims to relieve urinary pain, burning and urgency. It claims that it goes directly to the site of discomfort and provides relief quickly right where the pain is. The cranberry side to this product claims to maintain a healthy urinary tract and helps flush in order to maintain urinary tract cleanliness. Phenazopyridine Hydrochloride is the #1 ingredient prescribed by doctors and recommended by pharmacists specifically for urinary discomfort. Pacran is a super-concentrated whole cranberry fruit powder. 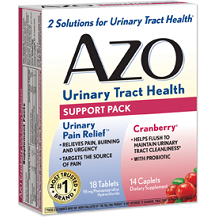 AZO Cranberry helps with flushing. When taking AZO Urinary Pain Relief take 2 tablets 3 times daily with or after meals as needed, up to 2 days if you are an adult or child 12 years and older. This needs to be taken with a full glass of water and this product must not be used for more than 2 days (12 tablets) without consulting a doctor. Children under the age of 12 are not meant to use this product unless consulting a doctor first. When taking AZO Cranberry Daily Dietary Supplement 2 capsules are meant to be taken daily with water. You are not meant to exceed the recommended serving. With regards to AZO Urinary Pain Relief, you need to consult with a doctor before usage if you have kidney disease, allergies to foods, preservatives or dyes or/and have had a hypersensitive reaction to Phenazopyridine Hydrochloride. You are not meant to use this product if you have Glucose-6-Phosphate Dehydrogenase (G6PD) deficiency unless approved by your physician. When using this product stomach upset may occur (taking this product with or after meals may reduce stomach upset) and your urine will become reddish-orange in color. The product states that this is not harmful, but care should be taken to avoid staining clothes or other items. You need to stop use and consult with a doctor if your symptoms last for more than 2 days or if you suspect you are having an adverse reaction to the medication. The product states that you need to make sure if you are pregnant or not before use. If pregnant or breastfeeding you need to ask a health professional before use. You need to keep this product out of the reach of children. Also, if there is an overdose of some sort, you need to get medical help or contact a Poison Control Center straight away. With regards to AZO Cranberry Daily Dietary Supplement, you are recommended to inform your healthcare professional before usage. The price of this product is a very cheap $7.03 each. This product recommends that If you are not satisfied with what you purchased you ask the retailer that sold it to you to refund your money. If the retailer will not accept the product, you may return it directly to them. If so, you need to follow the instructions below. If you do not have all of the information and documentation requested above, they will not be able to provide a refund. Refunds are only for the value of the product. Shipping expenses and taxes will not be reimbursed. They recommend shipping via certified mail, UPS, or some other service that will confirm delivery of your items.They will not accept expired products. Items must be returned/exchanged within 90 days of purchase. There is a maximum return limit of 2 items of the same brand. You need to allow 4-6 weeks for your return to be processed. This product seems to be very good. What impressed us is the fact that they are so transparent with regards to ingredients. The only caution I would take with regards to purchasing this specific product is that is that there seems to be so many side effects and cautions, which we find worrisome.